A totally different party for older boys & girls. Jimbo* applies very special Glitter Tattoos to the guest of the party. 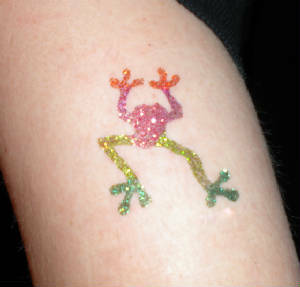 Glitter Tattoos are colorful, waterproof and last 4-5 days (yet come off easily with alcohol). The guest get to choose from a wide selection of tattoos. Once the tattoos are completed, Jimbo* will create a balloon figure and hat for each guest. Due to the time required for the Glitter Tattoos, there is a limit of 15-20 tattoos per party.